The main factor that determines whether your website topic will make money is: Do people search for your topic? Before you create your website you should find out how many people are interested in what you are about to write about. Google (search engines) knows exactly what people are interested in. Every time somebody does a search on Google.com it is stored in Google database. Google knows exactly what people search for and how much they search for it. This information is invaluable to you. Because with it you can determine what people are interested in. For example, you can find out how many people are interested in 'gerbils'. If lots of people do a search for 'gerbils' then you know that if you create a website about 'gerbils' you will get lots of traffic. The more traffic you receive the more money you make. Google wants to help you. They want you to create a website and content about things that people are interested in. So they provide a tool that you can use free of charge to find out what people are interested in. It is called the Keyword Tool. To demonstrate the power of the keyword tool we will imagine that you want to determine whether a website topic about 'traveling to Prague' has potential. Are people interested in traveling to Prague? Do they search for information about traveling to Prague on the Internet? Enter the keywords ‘prague travel’ into the keyword textbox. Enter the text to confirm that you are human. It tells you how competitive the market is for the keywords 'Prague Travel.' This is important because it tells you that advertisers are interested in these key words and are willing to pay more for them. The higher the competition the more you will be paid when ads are clicked on your website. This simple tool tells us a lot. We now know how many people are interested in 'Prague Travel'. We also know that advertisers are very interested in these keywords. You now know that there is a market out there for 'Prague Travel'. If you create a good website and if you do proper marketing people will come to visit your site because they are interested in ‘Prague Travel’. Now let's looks at something that, in terms of what people are interesting in, might not be a good niche using the keyword tool. Imagine you wanted to create a website about 'gerbil care'. Using the keyword tools lets find out how many people do a search for 'gerbil care' every month. Enter the keywords gerbil care into the keyword textbox. Compared to 'Prague Travel' the interest in 'Gerbil Care' is a lot less. 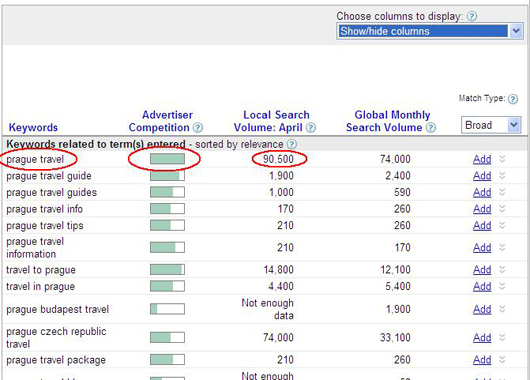 For the month of April only 3,600 people did a search using those keywords. Less interest means less potential traffic. Also notice that the advertiser competition is not as much for 'Gerbil Care' as it is for 'Prague Travel'. Clearly in terms of what people are interested in 'Prague Travel' beats 'Gerbil Care'. If you build a website about 'Prague Travel' there are more potential visitors than if you build one about 'Gerbil Care'. Unfortunately, it is not that simple - there is a catch. Because you are not the only one using this tool, other people also know that 'Prague Travel' beats 'Gerbil Care'. That means that there will be more competition for the term 'Prague Travel' than 'Gerbil Care'. There will be more websites that you will need to compete against. It is the basic free market rule: where there is more money to be made there will also be more competition. If you were the only one with access to the keyword tool then you would have a major advantage over every other webmaster. Only you would know what people are interested in and so you could target niches with the highest interest. But unfortunately everybody can use the keyword tool and everybody can find out which keywords have the highest interest. Therefore everybody comes to the same conclusion and everybody builds websites about the highest interest keywords. This means lots of competition. Basic principle: the more interest in a niche the more competition there will be. Once again Google provides the answer. This time we will use the standard Google.com webpage. For this demonstration I will use the 'Prague Travel' and “Gerbil Care' examples. In the search textbox type in “Prague Travel”. Make sure that you include the double quotation marks. The quotation marks are important because they tell Google to only bring up results with that exact phase. Click Search. Next we are going to find out how much competition there is for 'Gerbil Care'. Even before we do the search we can make the guess that there will be a lot less. We can make this guess because the Keyword tool told us that there is a lot less interest in 'Gerbil Care'. Less interest means that less people will make a website about it. In the search textbox type in “Gerbil Care”. Make sure that you include the double quotation marks. The quotation marks are important because they tell Google to only bring up results with that exact phase. Click Search. According to Google there are 14,400 websites with the term 'Gerbil Care” in them. As you can clearly see there is a definite relationship between the number people that are interested in a topic and the number of websites that are created for that topic. OK so what can you do? How can you determine which is a good niche and whether it will make money? It seems that there is no way to have an advantage. If you pick a niche with lots of interest there will be lots of competition, and if you pick a niche with little competition there will be little interest. Fortunately there are a few things you can do to get an advantage. Not all competition is created equal. There are the websites that you will never be able to beat. For example, if you plan to make a news website there is no way that you will be able to beat cnn.com. But depending on your niche there is a lot of competition that you can beat. Most of the websites out there are outdated and no longer in the 'market'. Google has them indexed and brings them up when you do a search – but, fortunately for you, they are crappy. If you create a good website for most niches you can rise very close to the top. Have a look at the competition for your niche. Go to Google.com and type in your keywords, for example, 'Prague Travel'. Look at the top 10 websites. Are they good? Are there any cnn.com type dominate websites that you can never beat? If the top 10 websites are cnn.com type super players then stay away from that niche – it is too competitive. 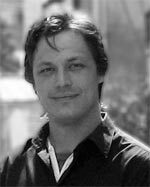 Try to find a niche that has simple hobby websites. A few big players at the top are OK. Your goal is not necessarily to be at the top of the niche. Your goal for now is to be on the first page of Google results for your niche. Have a careful look at the first page of Google results. Do you think your website can be better then most of the websites currently on page one? Sizing up the competition is a very subjective thing. Only you can determine whether you think you can do better than what is out there already. While you are checking the competition have a look for things they are missing. What could your website have that would make it better? What are some of the things that they are doing right? Do not be afraid to borrow ideas from the competition. If it works for them then it will work for you. The main idea is to find out what you are up against. Know the enemy. Because you are a late-comer you have a major advantage. You can take the good ideas from the competition. You can see where your competition is lacking and add it to your website. And finally you can see what your competition is doing wrong and make sure that you do not make the same mistake. There are advantages to being the first in a market, but there are also advantages to being the newest participant – you can learn from everybody else. They did all the hard work. You just pick out what works and leave out what does not work. Market inefficiencies occur when supply does not match demand. When more people want something than there is available supply. An example of a market inefficiency is when there are not enough available seats in the movie theater for all the people that want to see the movie. A sold out theater where people are turned away because the theater is full is an example of market inefficiency. There was more demand than supply. On the Internet there are no absolute market failures. At least I have never found a case where lots of people do a search for a keyword and there are zero results. The Internet is very efficient. For all keywords there is an interest for there will be websites created to accommodate. But that does not mean that there are no market inefficiencies on the internet. Market inefficiencies exist on the internet, you need to know how to find them. The idea is that you want a keyword phrase that has the highest amount of searches and the least amount of results. In other words, the lower the ratio number is the better. Now that we have both ratios we can compare. 'Gerbil Care' has a ratio of 4 while 'Prague Travel' has a ratio of 2. This means that 'Gerbil Care' is twice as efficient as 'Prague Travel'. There are more websites competing for each 'Gerbil Care' search. Remember the lower number is better – efficient is bad. You want to create your website in a niche that is inefficient – that has more searches with fewer results. So in this case 'Prague Travel' would be a better choice to consider as a possible niche for a website. This is because there are less websites competing for every search. It is important to remember that the ratio means nothing by itself. It only has value when compared with other ratios. To make this point clear let's do another example. You want to create a website about travel to Prague but you are not sure whether you should use the keywords 'travel prague' or 'prague tourism'. Compared to 'Prague Travel' which has a ratio of 2.09 'Prague Tourism' has a ratio of 8.68. 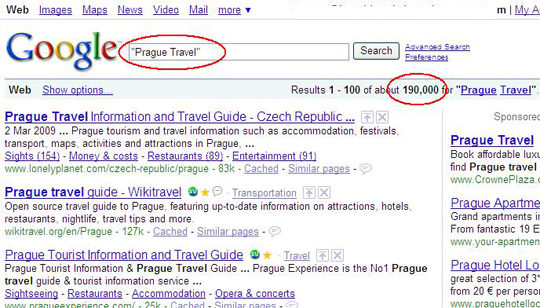 A clear indication that 'Prague Travel' is a much better keyword phrase than 'Prague Tourism'. Remember, the lower number is better. Imagine that the number represents the number of websites you need to compete against for a particular keyword phrase. In the case of 'Prague Travel' you need to compete against 2 other websites and for 'Prague Tourism' you need to compete against 8. Obviously is it better if you only need to compete against 2 instead of 8 other websites. Use https://adwords.Google.com/select/KeywordToolExternal to determine how much interest there is for your niche and how much advertisers are competing for it. Use www.Google.com to enter the keyword phrase into the search to determine how many websites contain that phrase. Remember to use double quotation marks around the phrase so that you only get results for that exact phrase. Check out the competition. Can your site be better than the competition? Can you make it to page 1 of Google search results? Use the Market Efficiency ratio to determine how different phrase compare against each other. Which phrase has the highest number of searches and the least amount of results – the lower the ratio the better.